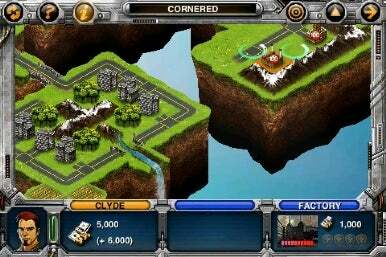 Rogue Planet from Gameloft is a turn based strategy game that seeks to take the crown as king of the genre for the iPhone and iPod Touch. With it’s involving story line, strategic gameplay and upcoming online play, Gameloft may have succeeded. Like many resource-based strategy games, you'll have to build factories to create certain troop types. You and the crew of the spaceship Nimah have returned to Earth after a thirty-five-year long voyage exploring space only to find it seemingly devoid of human life. That’s not to say there’s no welcome party waiting for you—it’s just not human. Hostile robots have overtaken the earth and it’s your mission to try to take it back. Rogue Planet has three modes of play to choose from—story mode, quick play and local multi-player (WIFI or Bluetooth). Quick play is a skirmish mode where you can play as either human or robot in any of the battles you have unlocked in story mode as well as 15 extra maps available by default. The local multi-player mode requires you to be in the vicinity of another iPhone with the game, but luckily the next update is reported to add an online option. Story mode has 19 levels and is where you’ll be spending most of your time (at least until the online option is added). Between battles you make your way around the different areas of the ship talking to people until you’re sent into the next fight. The story is revealed through these conversation cut scenes and serves to propel you through the game and keep things interesting instead of just having you fighting meaningless battles. The basic mechanics of the game are pretty standard for the genre—each turn you’ll be selecting and maneuvering units, engaging the enemy, gathering resources, building new units and so on. The turn based play (and lack of an "undo" button) mean each action must be well thought out. There are two basic types of units: vehicles and ground troops. Each type has light and heavy versions with different strengths, abilities, ranges and attacks. The arsenal you have at your fingertips is pretty extensive—everything from heavy assault units that do massive damage to engineers who just repair vehicles and heal units. Some units will run out of ammo or gas and need to be refilled. Some units can also be used as suicide bombers. If, for instance, you have a unit who is very low on life and otherwise useless, you can send him in close to the enemies and blow him up—thereby damaging anything that is nearby. With all the different possibilities you definitely need to have a good plan of attack. The hand-drawn artwork of the cut scenes look fantastic. The sprites and environment in the actual game aren’t as impressive but still look pretty good. The sound effects and music are decent but nothing mind blowing. The touch controls are pretty straight forward and easy to use. You just tap an unit or building and then tap the appropriate action for them to carry out. You can zoom in and out of the battlefield using the pinch gestures and pan around by dragging a finger. You can even move the landscape around in 3D space by dragging two fingers on the screen. Rogue Planet has quite a bit of replay value with the quick play mode, and will gain nearly infinite replayablity once the online mode is added. The A.I. was fairly challenging though every once in a while it would make some rather stupid moves. With its in-depth story and challenging gameplay, Rogue Planet is probably the best turn-based strategy game on the iPhone so far and easily worth the $5.00 asking price. Any fan of the genre will certainly enjoy this epic sci-fi game.